The fourth chapter of the Heath brothers’ book, Made to Stick, focuses on credibility, and breaks down the elements that make an idea credible. To illustrate some of their core concepts, I will use the All State Insurance campaign. When consumers go shopping for something like insurance, it is not a purchase they take lightly. People value their lives, loved ones and possessions at a very high degree, and they are not going to be willing to take any risks in protecting them. Therefore, as a company that offers this service, it is imperative that it offers credibility. Much like Safexpress had to prove their credibility to the Bollywood film company, All State must prove its credibility in order to gain significant market share. In one particular All State advertisement entitled “Tail Lights”, a long line of cars full of teenagers drives along an open road. Music plays and spokesman Dennis Haysbert states “Every year, six thousand teenagers go out for a drive…and never come back. Just talking to them can change that”. The camera zooms in on a young girl’s face through the window as she drives away into the darkness. The ad is promoting All States parent-teen driving contract. There are two Made to Stick elements at play here. First, the Heath brothers state that using vivid, truthful details can boost internal credibility. In this sixty-second TV spot, there are multiple shots of teens in their cars, laughing with friends or playing with a soccer ball. The attention that is paid to these details makes the teens more familiar, so that when Haysbert releases his statement on the number of annual teen driving deaths, the knowledge hits like a bag of sand. The details make the spot memorable, and relate back to the core idea of the campaign, which is to promote All State insurance. This method also makes the idea of teen driving deaths more concrete. This is also an example of the human scale principle. The Heath brothers believe that appealing to existing schemas in a consumers mind will generate a human context for the statistic. They state, “humanizing the statistic gives the argument a greater wallop” (145). Watching the line of cars full of teenagers drive away, knowing that they represent six thousand deaths, humanizes a bland statistic on paper. This makes the statistic much more powerful, and boosts All State’s credibility. You like Pepsi. I prefer Coke. Why? The answer is simple: we think one tastes better than the other. As the two major players in the soft drink market, Pepsi and Coke realize that taste is of the utmost importance. If the product tastes bad, it simply will not sell (see Coca-Cola Blak). Therefore when marketing their products to the public, both Pepsi and Coke must position themselves as great tasting beverages first and foremost. Everything else is secondary to taste. However, as consumers we have grown very wary of believing marketers’ claims, especially if we feel that they are not credible. What makes a Coca-Cola spokesman believable when he tells you that his brand of drinks tastes better than Pepsi’s? Nothing. He is supposed to be telling us that, because he wants to sell us his product. In other words, in order for these two soda giants to better market their drinks, they need to find credible ways to tell us that their drinks taste better. It just so happened that Pepsi beat Coke to the punch. With its Pepsi Challenge campaign, Pepsi found a credible way to deliver on its core message of great taste by using actual consumers as its spokespeople. After all, actual consumers are much more trustworthy than company spokespeople because actual consumers don’t care which brand other consumers buy; they are not biased. 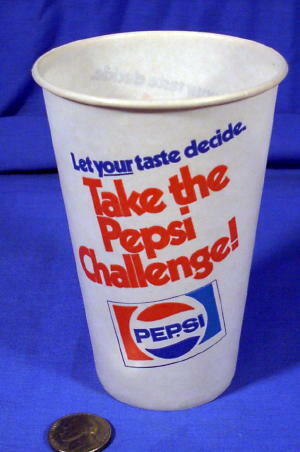 The Pepsi Challenge involved having a consumer drink samples of the two different colas (Pepsi and Coke) out of unmarked cups, and deciding which sample they thought tasted better. Naturally Pepsi found that consumers preferred the taste of their own drink the majority of the time (or else there never would have been a campaign in the first place). By letting the people at home know that ordinary consumers found Pepsi to be the better tasting cola, Pepsi made its claim credible. According to Chip and Dan Heath, having your customers test a claim is called a “testable credential,” (Heath, 157). Testable credentials are great at boosting credibility, and increased credibility leads to more effective – and sticky – marketing campaigns.